"'I prefer not to say I conducted them, rather that I made music with these marvellous musicians and human beings.' 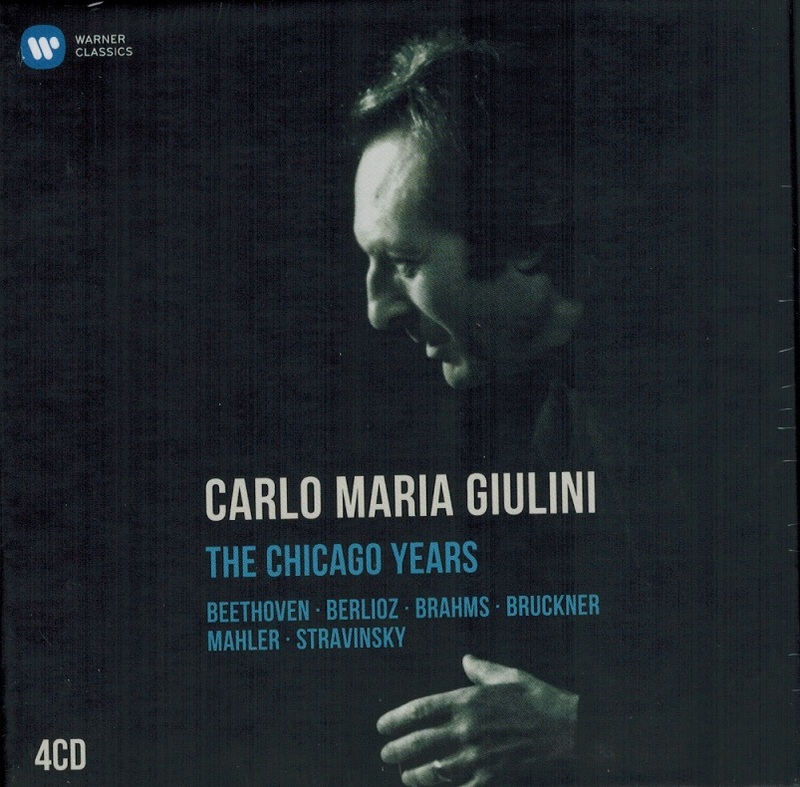 So Carlo Maria Giulini described his legendary partnership with the Chicago Symphony Orchestra - a relationship that was marked by mutual respect and affection and resulted in some of the greatest performances in the orchestra's history. 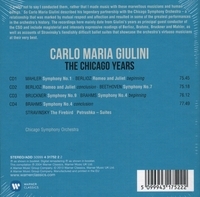 The recordings here mainly date from Giulini's years as Principal Guest Conductor of the CSO and include magisterial and intensely expressive readings of Berlioz, Brahms, Bruckner and Mahler, as well as accounts of Stravinsky's fiendishly difficult ballet suites that showcase the orchestra's virtuoso musicians at their very best." CD1: Symphony Number 1 in D (Gustav Mahler). Romeo and Juliet (Berlioz). CD2: Romeo and Juliet conclusion (Berlioz). Symphony Number.7 in A opus 92 (Beethoven). CD3: Symphony Number 9 in d minor (Bruckner). Symphony Number 4 in e minor opus 98 beginning (Brahms). 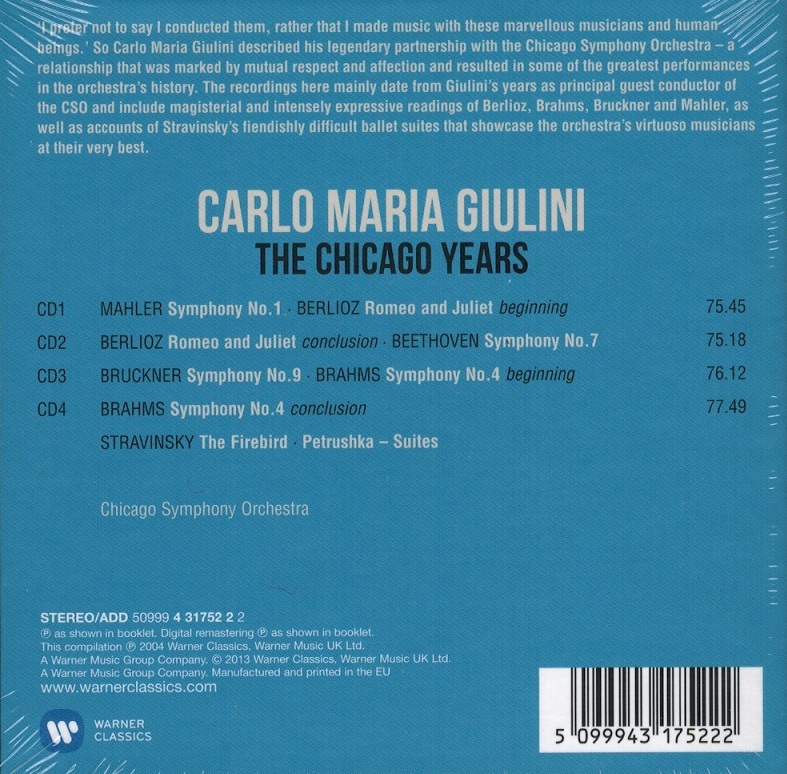 CD4: Symphony Number 4 in e minor opus 98 conclusion (Brahms). The Firdbird - Suite 1919 (Stravinsky). Petrushka - Suite (Stravinsky).